This is the third Terry Tyler book I’ve read. I keep waiting to be let down but it certainly hasn’t happened yet. I note that most of the reviews for this novel are 4 or 5 star with the odd lower rating creeping in. You can’t please everyone I guess – for those who rated it badly, clearly the style is not for you. For my own part, I find Terry’s characters are solid and are as varied in personality as any random group of people in the real world. 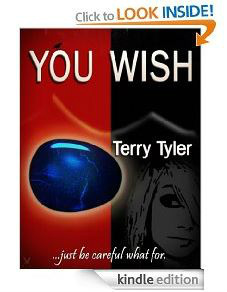 In ‘You Wish’ she has once again created a diverse set of unconnected people and woven their stories together in the most imaginative way. It is engaging and gripping and makes me want to read faster because I am so anxious to discover what happens next. Terry Tyler is a master in the art of writing page-turners and this one is no exception. Based on the old adage ‘Be careful what you wish for’ the book tells the individual stories of a disparate group of people who each make a wish which comes true in ways they did not expect. What I really love about this book is the way in which the wish-makers’ tales are told interweaved with the story of the wish-provider. I just could not see how it would all draw together in the end. But it did, and in such a lovely and imaginative way. Another five stars in my view.